In Vienna, Johann Strauss' operetta "Die Fledermaus" belongs to New Year's Eve like the New Year's Concert of the Philharmonic belongs to the first day of the year. 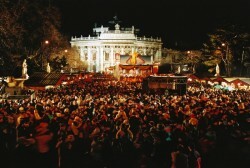 Other musical events at the change of year can be enjoyed at the Musikverein, Konzerthaus, Theater an der Wien and the Kammeroper. This article includes a total of 682 words.